Morrison versus Scott, originally uploaded by bill kralovec. 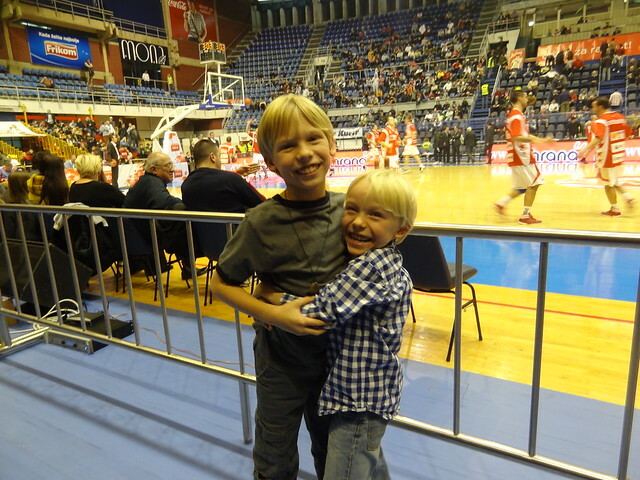 Last night I took the kids to the Red Star versus Radnićki game in the Adriatic Basketball Association (ABA). Radnički are the Detroit Pistons of the ABA, being from the motor city of Serbia, Kragujevac. They beat the Belgrade hosts, 83-79. 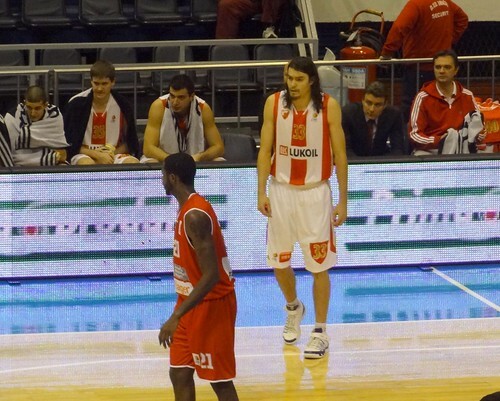 I was disappointed in Red Star and their American import, Adam Morrison. I heard a lot about the ex-Gonzaga player and was anxious to see him perform. He spent most of the game standing in the corner (see above) while the rest of the team handled the ball. They set no picks for him and he did not move without the ball at all. They also had him guarding the top player for Radnicki on defense, which got him into foul trouble in the first half. If you are paying for an import, you should use his strengths in the team’s offense. I was not happy with Morrison, he didn’t make much effort to get into the game and spent most of his efforts arguing with the officials. The most impressive player for Red Star was a young guy off the bench, Andreja Milutinović, a 21-year old guard. He looked about 15 years old, but drove to the basket strongly and had a nice outside shot. Red Star is falling down the standings of the ABA and it doesn’t look to be a good year. It is hard to support a team that is not putting out a full effort. I should be cheering more for Partizan who this week came from 21 points down in the second half to beat Armani – Milan in the Euro League. I want to support Red Star but they are making it difficult. Owen and Ollie had a nice time and we had great seats with our friends Jeff and Travis.